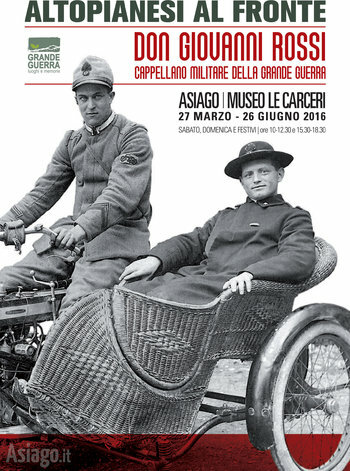 From March 27 to June 26, 2016, at the Museo Asiago Jails, will be an exhibition "inltopianesi at the front and Don Giovanni Rossi Chaplain of the great war". The exhibition, created by the municipality of Asiago in collaboration with the municipality of Ponte San Nicolò (PD), focuses on the figure of Don Giovanni Rossi, Chaplain of the great war. The exhibition will be opened on Sunday and public holidays, from 10 am to 12.30 and from 15.30 to 18.30. Admission is free for children younger than 6 years old and disabled. In the presence of guided tours, admission (includes visits) amounts to 6 euros.